Discover New PURINA PRO PLAN NutriSavour. A complete and balanced wet cat food that combines the exceptional nutrition you want with a variety of protein-rich tender chunks and delicious gravy that your cat will love. Meat and animal derivatives, vegetable protein extracts, fish and fish derivatives (of which 4% ocean fish), oils and fats, derivatives of vegetable origin, minerals, various sugars. I bought this for my 17 year old cat who has Gastro intestinal problems. I normally feed her on Royal Canin sensitive and fresh cooked chicken but she gets bored with these . I thought I would give her a change and mixed some of the new food with her usual food. She certainly appreciated it and ate it all with no adverse affect on her digestive system. It’s good to be able to give her some variety and her appetite has improved too. However, fed on its own, this new food did make her bowels loose so I always mix it 50/50 with her usual food. This works for her and she gets to enjoy a new taste. 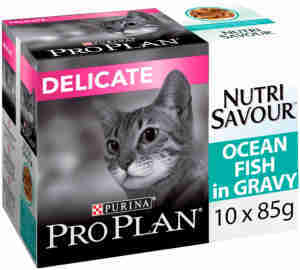 My three cats loved this food in a savoury gravy. Pity there isn't the same in jelly. I was recently advised to change my cats over to sensitive food - not an easy task as they're a fussy pair at the best of times! However, I'm pleased to say they are both enjoying this product, which is a huge relief.